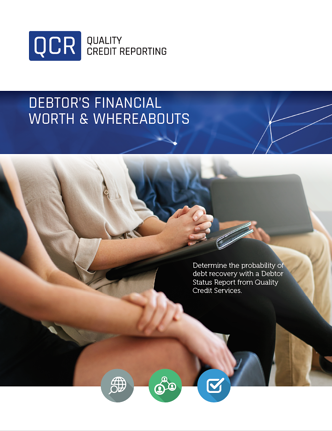 Determine the probability of debt recovery with a Debtor Status Report from Quality Credit Reporting. Establishing a debtor/defendant's financial worth and whereabouts is key when considering how to enforce a judgment. What Assets Can Quality Credit Reporting Identify? CMHC Approved Debtor Status Report: We provide many financial institutions or the law firms that represent them with a CMHC approved Debtor Status Report.